This is the time of the year where all the spending seems to come at once. There are some simple tips and tricks that you can use to help keep the holiday season more affordable and to even save money! Whether you celebrate Christmas, Hanukkah, Yule or one of the many other end of year traditions, this can be an expensive time of the year. Here are 10 things that we do in our family that greatly reduce the amount of money that we spend around Christmas time. I know it sounds kinda nerdy, but being prepared with a nice little wad of cash when it comes to the end of the year, really is a great stress reducer. To work out how much you need, add up how much you spent last year on extra food, outings and gifts and divide that number by 52. Now simply set up a separate bank account and an automatic payment in to it for each week. At the end of the year you will have a lovely little buffer to dip into. You may choose to make this account a bonus saver where you earn extra interest, or like us, have it set up saving interest against our mortgage. How many people are you buying for? Do you REALLLLY need to buy Great Aunt Sue another set of bath salts or letter set? If you have lots of adults to buy for, maybe you could suggest a Secret Santa deal, and make it that you only have to buy for one person. As a family we do homemade gifts for our parents, buy for only one of my 3 siblings (it is shared around), and get something for under $20 for each of the children cousins. Our own children get a small stocking of mostly treat food and hair ties/clips then their gifts from us are usually clothes, books and a practical something that they want – this year it is a sleeping bag each. If your gift list really is paired down as small as it can be already, suggest trying for homemade or second hand gifts. 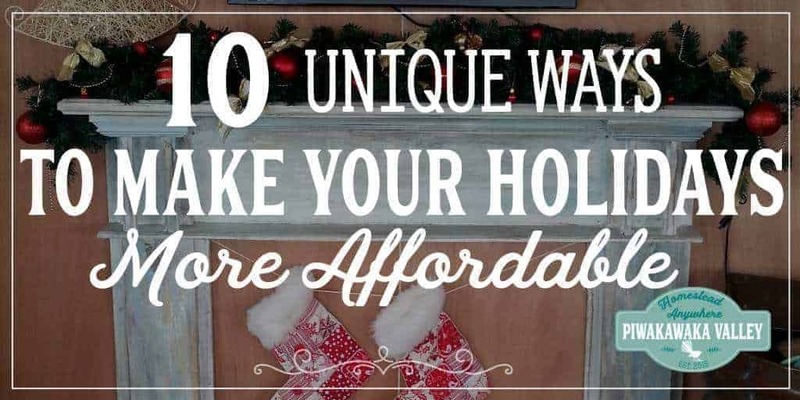 I have a great list of frugal gift ideas, not all of them are super cheap if bought new, but many you can find at garage sales, or make them yourself. Nobody NEEEDS to go to all the end of year functions. Choose your favorite ones and go to them only. This is a very busy time, but it is also a very magical time. Slow down and try to enjoy it. Don’t waste the whole month running from one event to the next. Friends, family, partners and children don’t really want the expensive things. What they REALLY want is you, your love and your time. Take a walk by the beach, or a drive to a mountain top. Play board games together, or a sport on the lawn. Make special loaded popcorn and watch a Christmas movie together. Roast marshmallows while listening to carols. Take a box of food to people in need, or to the food bank. Make gingerbread houses, or serve a meal at the soup kitchen. Stay up late and look at the stars. Find a candle light service to attend. Kids do not need more chocolate. They get enough sugar in their lives without starting the day with a handful of candy. You can make your own advent calendar very easily. Set up a simple string with an envelope for each day. Fill the envelope with a card with each day’s activity on it. All the activities above can all be included, as well at the kids end of year recitals, a special meal, visitors and crafts. If you are organized and plan ahead, you can avoid paying extra for convenience. Buy your celebration food over the month or so before the holidays as they come on special. However, only buy things you know you will use otherwise it will actually not save you money at all! Plan ahead to make something like vanilla essence, whipped body butter or beeswax wraps as gifts and save money buying something. If you are hosting people at any point over the holiday season, make it potluck! If you are too “Type A” to let people choose what they bring, and risk a whole table of potato chips and popcorn, then construct a list of ideas and put it on Google Drive so people can add their names next to it. You can also add links to recipes there. I know that for big crowds plastic disposable dinnerware is easy. I get it, I do. But don’t be lazy, save the planet and your wallet and just wash the dishes. It is so much nicer eating from a real plate, with real cutlery and drinking from actual glass. If you don’t have enough to make do from your place, ask a few others to bring some, or check out second-hand stores, garage sales or auction houses to grab some for super cheap. At the end of the celebrations, wash them, pack them in a box and store them in the garage or attic until next time. You don’t actually have to go away to be able to have a holiday. Stay at home. It saves you the travel cost (and stress! ), accommodation is free, and you already have everything you need to eat. No house sitter to pay and no pet sitter to organize. Set a budget and make a list of things you love to do in you area. Choose some things that you have never done too. You can use your budget to pay for meals out, or treat food from the store that you can make at home, or to get in to an attraction that you want to see. Put away your technology in another room for the week, and spend the time doing things together. If you really must check your technology, set a timer and when it goes off, it is all to go away again. Read here for some great tips for traveling with kids. So there you go, 10 ways you can save money over the holiday break. It might mean changing some of the things you do now, but you may well find a new tradition that you just love. Check out these 25 fun and frugal family traditions. What cheap or frugal things do you love to do to help make the holiday season more affordable? Great advice, we always had our children only ask for 4 items on their wish lists: something you want, something you need, something to play with and something to read! At least it kept their lists short! thank you for sharing your post on the Homeacre Hop, as one of the co-hosts I will be featuring your post tomorrow! Come back and share another post!